Read-out Instrumentation Signpost: Measuring Brillion scattering. Viavi Solutions is the only manufacturer which has developed a BOTDR system that is able to determine if a change in the Brillouin scattering* in an optical network has been caused by stress or a change in temperature. Even over long distances, these anomalies can be localized at an accuracy of a few meters. At Laser Components, these measuring instruments are available in two versions. - As part of a stand-alone OTU-8000 or a comprehensive ONMSi system, BOTDR measurement is a welcome addition to 24/7 surveillance of critical infrastructures. 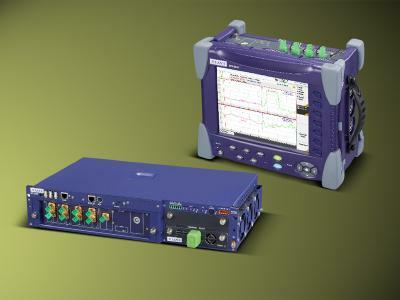 A single fiber for the test signal is sufficient to monitor the entire cable over long distances (up to 200 km). - In an MTS-8000 modular multi-test platform, the BOTDR solution offers additional measurement options for the deployment and maintenance of high-speed networks. The technician can check cables between 100 m and 200 km on site; at distances of up to 10 km, a resolution of just one meter can be achieved. Brillouin measurements are used to monitor gas pipelines, overhead lines, and bridges. The Viavi solution can be used, for example, to determine whether a fault in a district heating pipeline is due to temperature changes or mechanical influences. * Brillouin scattering, named after Léon Brillouin, refers to the interaction of light and material waves within a medium. It is mediated by the refractive index dependence on the material properties of the medium; as described in optics, the index of refraction of a transparent material changes under deformation (compression-distension or shear-skewing).